Film processing was performed by hand, using a system of chemical vats, until the first automatic film processor (which was more than 3 m long and weighed about 640 kg) was introduced in 1956. This system could produce a dry radiographic film in 6 minutes. A modern automatic film processor is illustrated in Fig (a) the film is fed into the input chute of the processor (inside the darkroom) and shuttled through the processor by a system of rollers. The film is guided by the rollers through the developer tank, into the fixer tank, and then into the wash tank. After washing, the film continues its path through the dryer, where temperature-regulated air is blown across the film surface and dries it. One of the functional requirements of the automatic film processor is to deliver consistent performance, film after film, day after day. Chemical reactions in general, and certainly those involved in film development, are highly dependent on both temperature and chemical concentrations. Therefore, the processor controls both the temperature and the concentration of the processing chemicals. A thermostat regulates the temperature of each of the solution tanks to ensure consistent development. The temperature of the developer tank is most crucial, and typically this temperature is 35°C (95°F). Pumps circulate the liquid in each tank to ensure adequate thermal and chemical mixing. As sheets of film are run through the processor, the reactions that occur between the chemicals in each tank and the film emulsion act to deplete the concentrations of some of the chemicals. 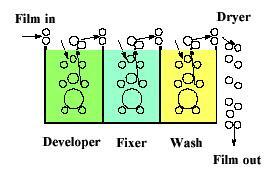 The automatic film processor replenishes developer and fixer chemicals by pumping in fresh developer and fresh fixer from storage tanks. When a sheet of film is fed into the input chute of the processor, it passes by and trips a small switch that activates the replenishment pumps. For each 35 cm of film length, about 65 mL of developer and 100 mL of fixer are pumped into the appropriate tanks by the processor. In addition to temperature and concentration, the extent of a chemical reaction also depends on how long it is allowed to occur. The film passes through the roller assembly at a constant speed, and all of the rollers are driven (usually by a chain and sprocket assembly) by a single-speed regulated motor. The time that the emulsion spends in each of the chemical baths is regulated by the length of the film path through each tank, which is governed by the depth of the tank and by the film speed. The developing agent gives up electrons to convert the silver halide grains to metallic silver. Grains that have been exposed to the radiation develop more rapidly, but given enough time the developer will convert all the silver ions into silver metal. Proper temperature control is needed to convert exposed grains to pure silver while keeping unexposed grains as silver halide crystals. Stopping the development - The stop bath simply stops the development process by diluting and washing the developer away with water. Unexposed silver halide crystals are removed by the fixing bath. The fixer dissolves only silver halide crystals, leaving the silver metal behind. The water bath simply washes residual chemicals out of the film emulsion. Water is continuously cycled through the processor; room temperature fresh water comes in from the plumbing to the wash tank, and water is drawn away from the tank and fed to a drain. The last step that the film experiences as it is transported through the processor is drying. A thermostatically regulated coil heats air blown from a powerful fan and this warm air blows across both surfaces of the film. A series of air ducts distributes the warm air evenly over both surfaces of the film to ensure thorough drying. 1. What is the ideal temperature to be maintained in the processor?